Classified ads may be posted by SCHSIA members only. There is no fee for posting an ad. Only ads about St. Croix sheep or related items (herding/LGD dogs, equipment, etc.) will be allowed. Ads for other sheep breeds are not allowed. To place an ad, click the Place Ad link below. Your ad must be approved by an administrator before it will be visible on the website. 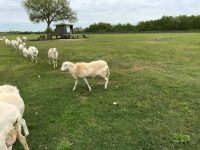 For Sale: 22 Registered St.Croix Ewe Lambs. 8 months to 1 year old from closed flock. I have 4 RR registered breeding quality ram lambs.